The autobiography of Isira’s remarkable journey to enlightenment and beyond. Isira was born awake. Unusually, she was not just awake to the world around her; she was also awake to her true nature – the eternal Self of pure love and awareness. As a result her life has been, and is, extraordinary. Through deep mystical encounters and worldly traumas and challenges, Isira was able to meet each situation in unexpected ways – revealing an example of liberated being. Isira writes about her challenges and joys: of the childhood pain of being rejected as a misfit; of life as a street kid; of being raped and almost murdered as a teenager; of travelling to Tibet and ordination by HH the Dalai Lama; of Tibetan Lamas, aware of her incarnation, fetching her from Adelaide to the Himalayas; of marriage and motherhood; of ‘terminal’ illness healed; of discovering her secret Aboriginal heritage.. Throughout all of this she embodied unconditional love and compassion, revealing a powerful love that transformed and miraculously healed many situations. Around these life events she weaves the story of her vivid inner journey – of dreams and visions; of karmic threads of other lifetimes and planes of consciousness; of insights and wisdom gained; and, with immeasurable gratitude and humility, of profound personal spiritual experiences – ‘awake in the ocean of bliss’. Since the age of 18 her life has been dedicated to the awakening of humanity. Few have travelled the path of true enlightenment. Fewer still have written down the story in such depth and detail for the benefit of fellow travellers. And so Isira’s story offers rare insight and encouragement, revealing what is possible for each of us, if we choose it. 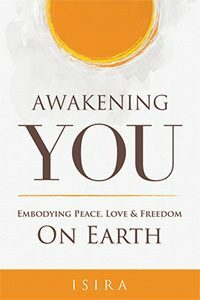 Isira is not well known here in the US, but she is an amazing being and eventually the rest of the world will discover this Australian enlightened master...This is not a book that gives you specific steps on "how to awaken." Rather, it sort of teaches you through her stories. Even the chapter titles, which she calls Keys, are unique and captivating. Firstly, I started to read "An autobiography of a Yogi" which had been sitting on my bookshelf for about 10 years! It was a bit of a struggle, but I felt it was important to do . As I was approaching the last chapters, I came across Isira's book. Oh so much easier to read, and I felt it was also a journey of a Yogi, but in much more relevant terms to this day and age, even though the first book is regarded as a classic. Isira's journey seems to make it possible for all of us. "I didn't read it.... I drank it! It wasn't just a read, it was a very powerful experience for me. I had trouble sleeping for a week. After each intense reading session, I cried deeply. I didn't understand what was happening and went into such healing mode each time I would read it, and one night I gurgled so loudly and for so long, I had to laugh, it was extraordinary.